Police have identified a few suspects involved in killing 2 Hanuabada men early this year. A Hanuabada spokesperson Lohia Samuel said he has been reliably informed by police investigators that they believe they have found some suspects who will be called in for further questioning. He said so far the investigations have gone well but arrests are not likely to happen this year as police will need to go through the files of the suspected officers. Mr. Samuel said police statements seem to be consistent and arrests will be expected to be made in the earlier part of January 2016. 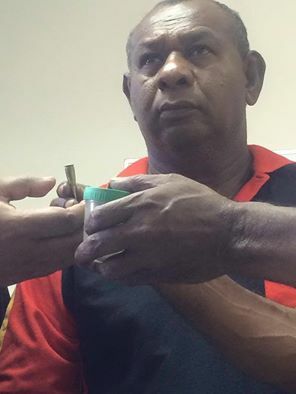 Picture: A surviving victim of the HB shooting showing the bullet he was allegedly shot with.